The ViaRhôna is a cyclist path of 815km that goes from the Leman lake to the beaches of the Méditerrannée along the Rhône. There you’ll see the beautiful landscapes of the Alps, the vineyards of the famous Côtes du Rhône and the beaches of Camargue. 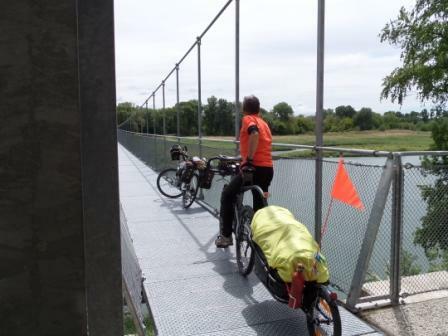 Dominique has chosen the UNO 100 bike trailer for this trip. 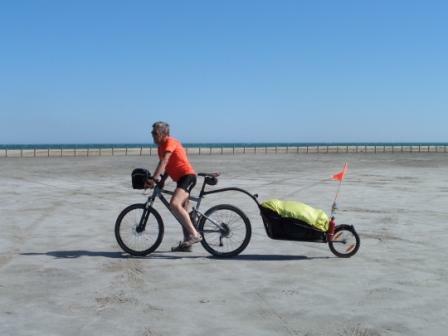 “We have used the trailer Bob for a few trips but this year we decided to change for the UNO 100 bike trailer to get a better handling ability. 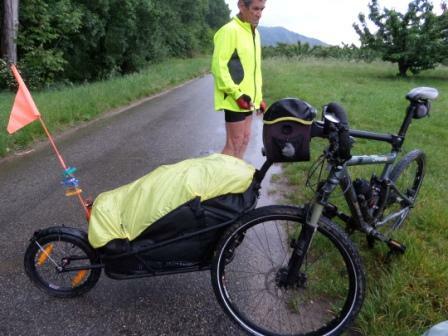 We tested it for 10 days along the ViaRhôna with rainy days and high winds. Well, it was a real pleasure ! Easy to use, the material is very strong and the bag is perfectly waterproof. We also found that this trailer was easier to use and to pull. The UNO 100 is the Aevon trailer reserved to a use on roads. It can carry up to 35kg and has a capacity of 100L.